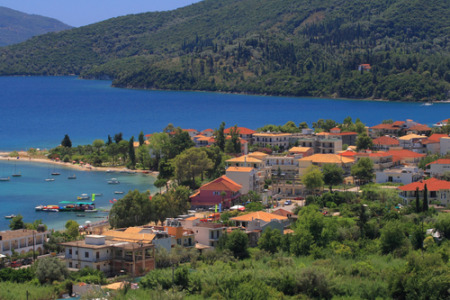 Nidri holidays take you to the east coast of Lefkas which is connected by bridge to the western coast of mainland Greece. It is the largest resort on the island and its wide ranging facilities mean that holidays in Nidri have broad appeal. The man-made sandy beach, washed by the sparkling waters of the Ionian Sea, provides safe bathing for children and less confident swimmers and a variety of water sports are available. Holidays to Nidri can be taken from April to October when the temperature rises from twenty to thirty at the height of the season. If you are looking for a guarantee of summer sun in a lively resort, you may be tempted by our cheap Nidri holidays which are considered great value as our commitment to quality is never compromised. Nidri is a great sailing centre and in September the bay is filled with yachts participating in the Ionian Regatta. With good accommodation, restaurants and tavernas catering for all tastes, and a more than adequate number of shops, our low cost Nidri holidays are sure to please. For further details and to discover our latest Nidri holiday offers, please use the search facility.